On May 1st, fast food and other low wage workers will announce their intention to place a home rule charter amendment question on the ballot in November that presents an opportunity for the residents of Philadelphia to vote in support of a $15 minimum wage. Mayoral polls done by municipal union, AFSCME have already indicated support for a $15 minimum wage in Philly to be as high as 87% among likely voters. A popular referendum on $15 an hour in November will put pressure on the state legislators to raise the minimum wage across the state to $15 an hour, to lift the undemocratic ban on municipal wage increases, and set the stage for city council to institute bold measures to challenge the ban if no action is taken on a statewide level. Additionally, State Senator Daylin Leach (D-Montgomery/Delaware) today announced legislation to raise the state minimum wage immediately to $15 per hour. The bill would also index the minimum wage to inflation and eliminate the tipped minimum wage. He and 15 Now are seeking co-sponsors in the PA Assembly and Senate for the $15 bill. 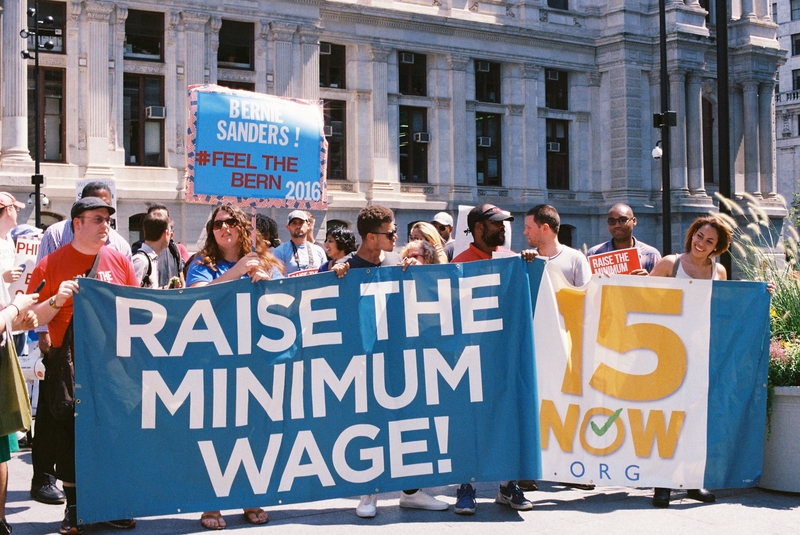 Said 15 Now member Sarah Giskin, “15 Now PA is heartened to see that Pennsylvania state representatives are turning the urgent demand for a $15/hour into action. 15 Now chapters across the state will be pushing hard for Senator Leach’s bill. We are prepared, however, to fight for the removal of the undemocratic ban on Philadelphia raising its own minimum wage if the legislature does not pass a statewide $15/hour bill. We will do whatever it takes to end poverty in our city, starting with putting a $15 minimum wage referendum on the November ballot in Philadelphia. In 2015, the #fightfor15 and #blacklivesmatter movements have set a tone of mass struggle to achieve dramatically improved working and living conditions, especially for people of color who are over-represented in low wage work. Philadelphia is the poorest major city in the country, and 28% of residents live under the federal poverty line. 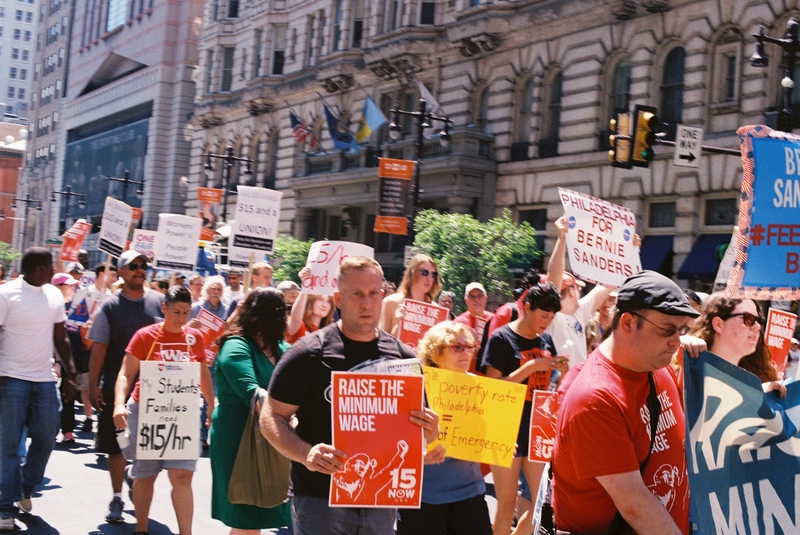 On International Workers’ Day, Philadelphia workers will uphold the holiday’s bold history of struggle, by demanding a minimum wage of $15 an hour in the city of Philadelphia and across the state of Pennsylvania. May Day is rooted in the struggle for the 8 hour day, when hundreds of thousands of workers across the nation staged a general strike to win a shorter work day and higher wages. HARRISBURG – State Senator Daylin Leach (D-Montgomery/Delaware) today announced legislation to raise the state minimum wage to $15 per hour. The bill would also index the minimum wage to inflation and eliminate the tipped minimum wage. Leach explained his proposal to his Senate colleagues in a co-sponsorship memo, attached to the announcement today. Leach will speak about his new bill at a rally for advocates of a $15 minimum wage on Friday, May 1, 2015 in Philadelphia. Details are below. [Philadelphia, PA]– On Wednesday, students and employees of ‘15 Now Temple’ launched one of the first campaigns in the nation for a campus-wide $15 minimum wage. 15 Now members read a letter to President Neil Theobald co-signed by students groups, student workers, food service employees and adjunct professors that put forth several key demands for economic justice in North Philly. After several speeches by students and Temple staff, the group attempted to enter Sullivan Hall to deliver the letter to President Theobald. They were met with campus security, and the president refused to receive any student representatives in his office. The 15 Now letter demands that Temple immediately pay all campus workers at least $15 an hour, including work-study students and student-workers. Regarding contractors who refuse to pay $15 an hour, students recommend the university seek to contract with companies that will fulfill Temple’s stated commitment to North Philadelphia with a $15 wage standard. Additionally, 15 Now Temple demanded Temple publicly endorse a $15/hr minimum wage in Philadelphia for every worker in the city. 15 Now Temple stands in solidarity with the United Academic of Philadelphia to demand that Temple University allow adjunct professors to vote on their union immediately. Philly’s $15 Minimum Wage Hearing March 4th! On Wednesday, March 4th ’15 Now Philly’, SEIU 32BJ, and fast food workers are hosting a hearing in front of Philadelphia City Council on the $15 minimum wage in Philly! It is a huge victory for low wage workers all over Philadelphia that our elected officials will hear the economic, moral, and legal case for implementing a significant raise in the minimum wage. But for our hearing to have the most impact, we need to pack City Council chambers on March 4th. We need to fill the chamber from the floor to the balcony to show City Council we can’t wait a $15 minimum wage for all workers. We need YOU present at the hearing to win $15 an hour.